A sensor-augmented insulin pump (SAP) combines the technology of an insulin pump with a continuous glucose monitoring sensor that transmits glucose readings to the person wearing the device. It is considered to be an important step in the development of an artificial pancreas. 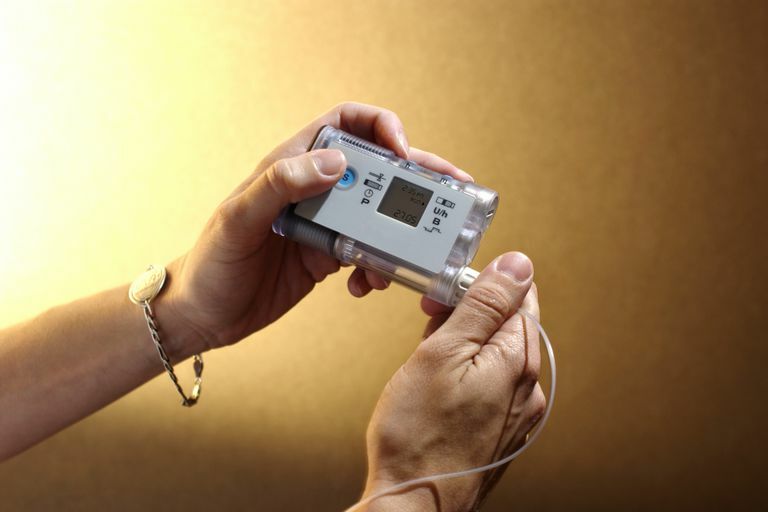 Standard insulin pumps provide the user with a continuous flow of short-acting insulin that has been shown to improve glucose management in many people. The addition of a continuous glucose sensor to work in tandem with the insulin pump has been a great advance. This allows the user to have continuous, real-time glucose readings that enhance the ability to monitor glucose, especially when making decisions that involve food, exercise, and sick-day management. This feature allows insulin delivery to be suspended automatically for up to two hours when the continuous glucose monitor detects that the glucose level has fallen and there is a risk of hypoglycemia. A 2013 study in Australia of 95 patients with type 1 diabetes concluded that this reduced the rate of severe and moderate hypoglycemia episodes compared with standard insulin pump therapy. This is thought to be another step towards an artificial pancreas. Sensor-augmented pumps also come with a feature called a bolus calculator. The user inputs the number of carbohydrates the user intends to take in, and the pump calculates the corresponding units of insulin that should be used to cover those carbs. Sensor-augmented pumps are an advance from standard insulin pumps but are not yet perfected to the point where insulin can be automatically dispensed based on the glucose reading. This requires a precise algorithm that coordinates the communication between the sensor and the pump. Researchers are still working on this algorithm and expect this problem to be solved within several years. When that occurs, we could have the first closed-loop system for managing type 1 diabetes. A closed-loop means that the pump would act like an artificial pancreas—it would read the glucose and dispense the exact dose of insulin needed to maintain a stable glucose level. The STAR 3 study looked at whether the sensor-augmented pump performed better for reducing Hemoglobin A1C in both adult and pediatric patients with inadequately controlled type 1 diabetes, without an increase in severe hypoglycemia. The study found a 1.0% mean AIC reduction in adults from baseline to one year, which was four times better than the improvement seen in patients using daily injections. The results were better in those who wore their sensors more than 81% of the time. In the continuation phase of the study, they noted that wearing the sensor more than 40% of the time was needed to maintain the A1C benefits achieved. Adults were more likely to wear the sensor longer and to get better A1C benefit. The rate of severe hypoglycemia events did not differ between the groups, and there was no difference in weight gain. Richard M. Bergenstal, MD, et. al. "Sensor-Augmented Pump Therapy for A1C Reduction (STAR 3) Study Results from the 6-month continuation phase." iabetes Care November 2011 vol. 34 no. 11 2403-2405. Trang T. et. al. "Effect of Sensor-Augmented Insulin Pump Therapy and Automated Insulin Suspension vs Standard Insulin Pump Therapy on Hypoglycemia in Patients With Type 1 Diabetes A Randomized Clinical Trial." JAMA. 2013;310(12):1240-1247. ​doi:10.1001/jama.2013.277818. Eda Cengiz, et. al. "New-generation diabetes management: glucose sensor-augmented insulin pump therapy." Expert Rev Med Devices. 2011 Jul; 8(4): 449–458.